Proper storage of coins is extremely important for the avid coin collector. If you have just started collecting coins then one of the most important things you need to learn is how to properly store and display your coins. Any damage to your coins such as scratches, discolouration and fingerprints can bring their value down by half. Listed below are 5 different ways to store coins. This short guide should help you on your way to picking the best way for you to store your growing collection, and make them not only look aesthetically appealing but also help you maintain their value. A coin folder is one of the easiest, least expensive ways to organize and store your coins. Coin folders are cardboard pages that have holes cut in to them to fit the coins exactly and hold them in place. Beneath the coin is a label clearly showing the description of the coin to help with identification. It is important to note however, that only one side of the coin will be visible and the coins will be exposed to the elements, making them harder to preserve. Coin Albums can be described as an upgrade of the coin folder. However, whereas with coin folders you have limited space and protection for your coins, coin albums usually have space for around 100 coins, with larger albums holding double that. 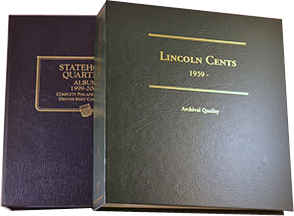 Unlike coin folders, coin albums do have plastic protection for your coins, meaning that they are protected from the elements and you can see both sides of the coin. 2"x2" coin holders, also known as 2 by 2s are cardboard holders that are cut into 2 inch by 2 inch squares, with a hole cut in the middle to fix your coins. There is a Mylar sheet glued to the inside of the holder and when it is stapled shut it protects the coin from the elements while allowing it to be viewed from both sides. Coin edge holders are Mylar plastic holders that allow you to store your coins in a relatively air tight environment, ensuring that your coin is protected from the elements. These holders are unique because they allow you a 360° view of the coin, including the edge of the coin. This allows you to see any writing that may be on the side of the coin. These are by far the best way to store your coins. The coin is protected by an inert (PVC free) plastic and sonically sealed to provide an almost air tight environment. Coin slabs are usually given with coins that have been graded for authenticity. They are clearly labelled, with the grade of the coin and when the coin was graded indicated on the label. These are just a few of the ways that there are to store your coins. Any one of these techniques is going to ensure that the value of your coins remains intact and that your collection remains aesthetically pleasing. There are many methods to safely storing coins. The storage method should be dictated by your goal and your coins value. 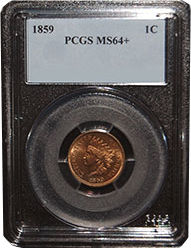 High end coins should be graded and stored in slabs, while mid grade coins can be stored in things like books and holders. If you want books and holders there is no better company to check out than Whittman, you can also buy their products on Amazon. If you would like to read more about coin grading, and learn about the top coin slabbing/grading companies read this.